The Beck Center provides all students at The University of Texas School of Law with a foundation for excellence in legal research, oral presentation, oral argument, and most importantly, legal writing. The center is the organizational focal point for the required first-year courses in legal research and legal writing as well as advanced courses available to upper-class students. Beck Center faculty teach the first-year legal research and writing courses and many of the advanced courses available to upper-class students. 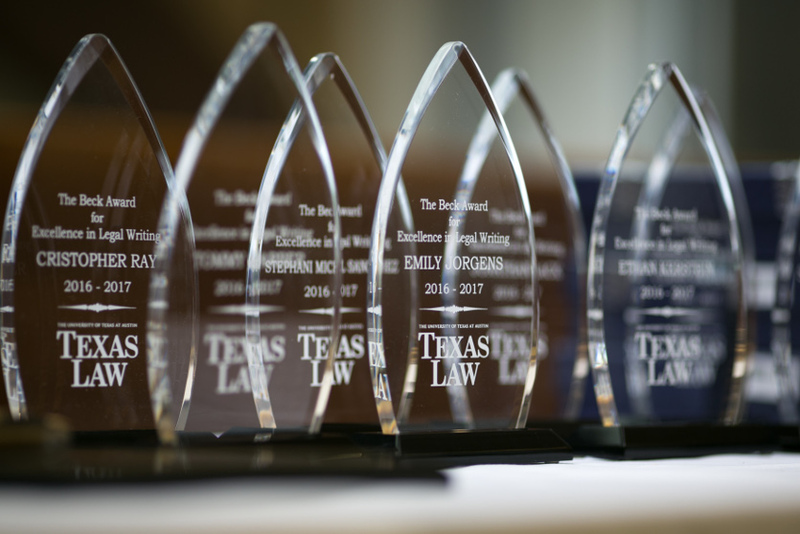 Each year the Beck Center faculty choose the recipients of the Beck Award for Legal Research and Writing Excellence, awarded to one or more students at the conclusion of the first year. At Texas Law we place a high priority on producing great writers, and we have one of the top programs for that purpose in the country: the David J. Beck Center for Legal Research, Writing, and Appellate Advocacy. Beck Center faculty aren’t part-timers or teaching assistants; we have eight full-time instructors whose only job is to help our students make their writing compelling and effective. Throughout your first year, you’ll meet in a class of 20 to learn how to craft powerful legal arguments in written form. You’ll also be introduced to oral advocacy through our first-year moot-court program, which can provide a basis for further work in our advocacy program during the second and third years of law school. Meet the Beck Center faculty.